Bio Pond Filter only. Non Pressurized NO UV, Filter brush replaces UV compartment. Filter material consists of brush, filter sponges and Supra Bio Media. 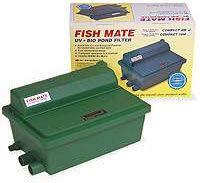 Perfect starter filter for small ponds. Inlet size 3/4" Outlet size 1.25"